The open back design ensures that this leg wrap can be put on and taken off with ease. It has a reinforced bottom and your feet hold the cover in place. It has extended wings that can be sat upon to secure the top, or as an alternative, there is a waist band that can be used if required. The Skoota Leg Wrap has a concealed security pocket. The open back design ensures that this leg wrap can be put on and taken off with ease. It has a reinforced bottom and your feet hold the cover in place. It has extended wings that can be sat upon to secure the top, or as an alternative, there is a waist band that can be used if required. The Skoota Leg Wrap has a concealed security pocket. The outer is fully waterproof and is lined with a luxurious fleece, this wrap will always keep you dry and warm. 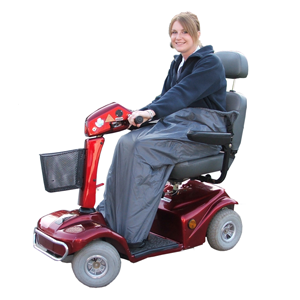 It is available in one size in a choice of Royal Blue, Grey or Maroon.